The one thing people seem to miss when they start eating paleo or gluten-free is pizza. Pizza is kind of its own food group. 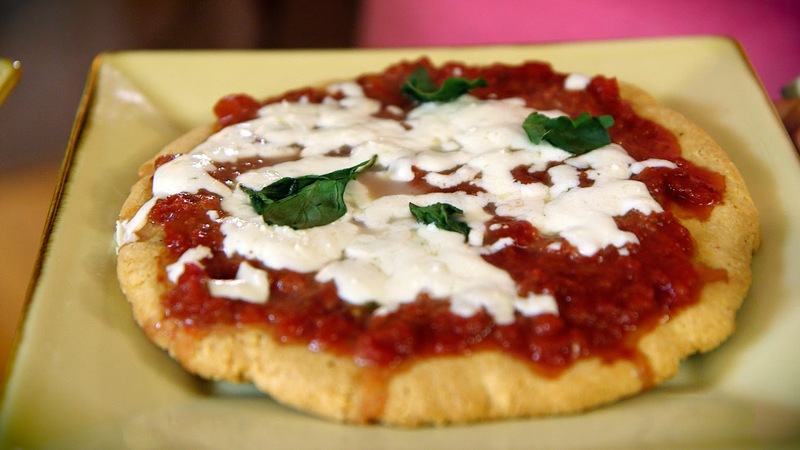 Well, hopefully, this recipe will help with those pizza cravings. With a few simple swaps, I figured out a healthy, "clean eats" version of pizza crust that gets two thumbs up from my kitchen partner Max of Max's Best Bootcamp. Regular flour was tossed to the curb for almond flour. And, the immediate benefit is that since we didn't use any yeast, this dough is ready to use as soon as it's mixed together. No waiting for the dough to rise. Since the dough is fairly sticky, it's best to cook it on a piece of parchment paper. Use the parchment whether you're cooking on a pizza stone or just a rimmed baking sheet. I also should note that cooking time seems to vary a bit between pizza stone versus baking sheet. Just keep your eye on it. Once you initially cook the dough, it's time for toppings. The toppings are whatever you want them to be - dairy, no dairy, meat, no meat. 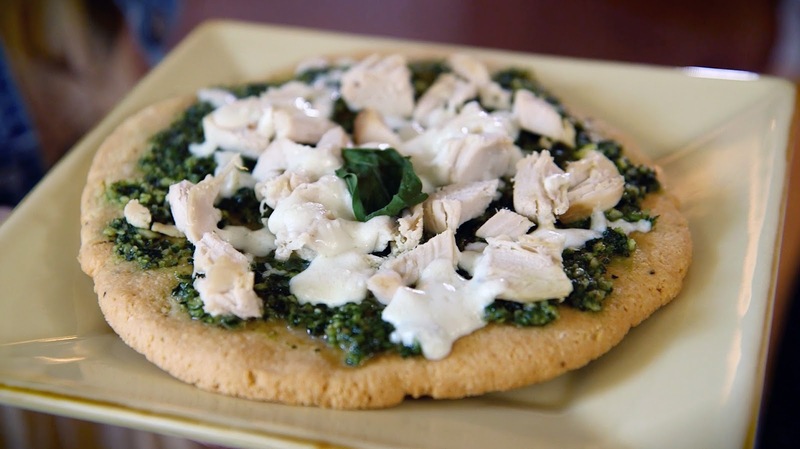 In the recipe video, Max wanted to do a straight up Margherita pizza while I wanted to go a little fancier with pesto and shredded chicken. So, we decided it would be fun to split the pizza crust dough in half and make two individual pizzas. I'll be honest, this crust isn't low calorie, after all, it's based on nuts. It's also denser than traditional dough and infinitely more filling. However, it's still a healthy alternative, is easy to make, and tastes good too. Preheat oven to 400-degree Fahrenheit. If using a pizza stone place in the oven before preheat. Add the dry ingredients into a large bowl. Add then eggs and coconut oil. Stir until well combined/ The dough will be sticky. Place the dough ball onto a piece of parchment paper and spread into a circle sing your hands. Transfer dough and parchment onto pizza stone. Bake 10 to 15 minutes, until lightly golden. Add toppings, to your taste, place pizza (still on the parchment paper) back into the oven until warmed through and the cheese is melted. Shared with my mom, who started a Paleo diet two weeks ago! That sounds like a great pizza crust! Is it a bot sweeter due to the almond flour? I've never used it and will need to do some searching in the grocery for it. You can definitely taste the nuttiness of the almonds, but it is not sweet at all. Try the baking aisle or the natural foods aisle. My go-to brand is Bob's Red Mill.